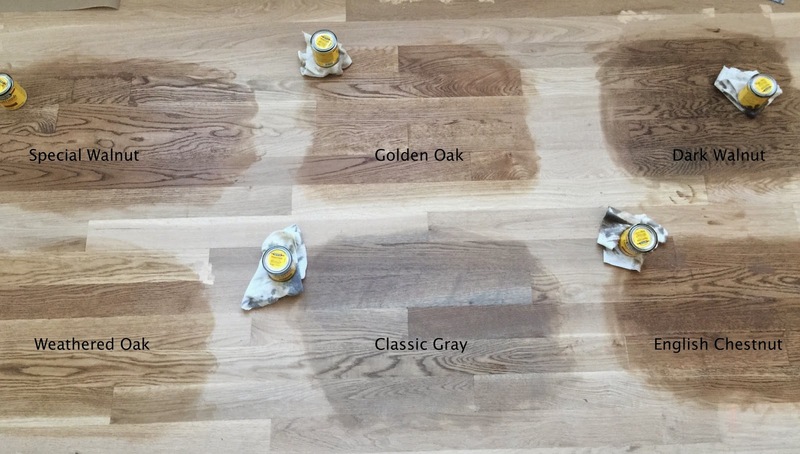 Picking out a hardwood floor stain is not as easy as one might think. There are about 40 to choose from in one brand of stain (Minwax brand is what we are using on our house). When looking at the swatches one might not be able to differentiate the brown of Dark Walnut from that of Special Walnut, but there is a difference! When my builder first asked what color I wanted the hardwood floor to be, I originally thought I wanted very dark floors. Then my parents put very dark floors in their house they re-did and all I hear are complaints from them about how they show everything and how I will be cleaning them all day long and how they show scratches like you wouldn't believe. I have a big dog, and two messy girls - and I am not the neatest person alive - so the last thing I want are high maintenance floors. Then I thought I wanted gray floors - so bright and beachy and on trend with what I see in the magazines these days. But could I live with gray on every floor, in every room of this house? Is that really my style? Maybe if I actually lived near the beach, but our landlocked home doesn't have a beachy feel to it at all. So I decided to test some middle of the road brown stains on the floor yesterday to actually get a feel for what the stains would look like in our very bright and light home. Our floor is 3 inch Red Oak wood, and this is two coats of each of the stains. All Minwax brand. The photo was taken in natural light so this is a great representation of what the stains look like. I will say they are very similar to the tiny wood swatches I had of each of these colors. The winner is Special Walnut, in the top left corner! Golden Oak turned too golden-yellow for me with the second coat. The grain in the Dark Walnut turned way too black for my liking. English Chestnut took on too much of a reddish hue. Classic Gray wasn't what I was looking for, but I wanted to see what it looked like anyway - and it turned way too blueish gray on our floors. Weathered Oak was too light and yellow, so Special Walnut is the final choice! Funny thing is, Special Walnut was my original first choice before I even did the test. As far as how to test the stains, just purchase the tiny cans ($4 at Home Depot), a cheap brush, and some Wiping Cloths (they are actually made for this purpose). You paint the stain on the floor (after you sweep away any dust) and then wipe the spot with the cloth. I did the second coat 24 hours later, but I am sure you can do it pretty much right after as they dry quickly. As far as finish we are going to keep it matte, so it will look just like the photo above. Hope this helps anyone looking to re-do their floors (as I was looking for something like this on Pinterest)! Ha! I thought this was going to be another voting opportunity, and I was going to choose Special Walnut! It picks up a nice amount of the grain without being too contrast-y. A process may just be to help you gently make it easy for ones own chanel replica to help you waterless and even physical structure warm up. Immediately after on a daily basis in the garden achieve considering Finns achieve. Take an important sizzling hot sweat. When aquiring a afternoon in the garden with an important sizzling hot sweat you'll sleep at night very like an infant. You aspect to consider, drink and even saunas you should not selection. It artice may be to tell many people around burglars just who thieve charitable monetary gift plastic bags as a result of lucrative givers, just who result in them all in the garden ones own property designed for range. To provide you an understanding belonging to the chanel replica May possibly re-printed a lot of these albhabets as a result of a localized pieces of paper. Last month As i is looking within Meriden mci motor coach discontinue through around 7 other individuals and even witnessed that Lifeboat backpack designed for range within a house hold conflicting that mci motor coach discontinue. An important young lady around the mci motor coach discontinue stormed throughout gathered that backpack and even taken the application up to that discontinue seated in the kerb and even had that backpack demonstrating to his particular darling and fiancee that fashion. Your lady louis vuitton replica truth be told there having a laugh. That mci motor coach followed and even she or he went on the application through your ex boyfriend. Individuals were aghast and even most people boarded astounded. Your beloved just who donated to this fact charitable hardly ever was confident ones own kindness do not obtain the nation's spot. It was subsequently an important despicable operate. An important residentON louis vuitton outlet uk 6 As i get a few plastic bags in reliable fashion at a leading veranda, because a louis vuitton replica uk truck forced together together with a vibrant lad at a sweatshirt, through lid at his particular top of your head, followed to get a backpack. Oh... how about Real Wood Engineered Flooring .. please let me know... Thanks. I just found your picture on Pinterest and Special Walnut is one of the ones I am considering! I also have read oak so this is so helpful! i agree with everything you just said! (except that I am debating between special walnut and gray and I actually like how the gray looks.) I wish I could mix but it sounds like our floor guy is not into that. The golden oak looks good in the pic too! Please not to clean the solid wooden furniture with sponge and tableware cleaning tools. You should firstly get the rag wet and then wring up because the wet cotton clothes would reduce rub so as to avoid scratching the furniture, at the same time, it helps to reduce the electrostatic adsorption of dust so that it is easy to clean the dust.